This holiday season a lot of us might need to be reminded about our worth and value in this world. Yes, Christmas is about celebrating the birth of Jesus, but it can also be a time when we need to reaffirm what it means to have a relationship with Him. This sentiment is true regardless of whether or not you’ve made the personal decision to become a follower of Jesus Christ. We all need to know we are supported, loved unconditionally, and worthy of forgiveness from those we love most. There are some truths we can take directly from the Bible that tell us exactly what it means to be connected to God through His son, who took away all our sins on the cross. As believers, we can hold onto these truths as a source of comfort and strength. 1. We’re completely forgiven and we’re fully pleasing to God. When we choose a relationship with Christ, we no longer have to worry about being held down by our past transgressions. We don’t have to live life feeling judged or condemned, because with Jesus, we have been redeemed. Our sins are completely forgiven and we are pleasing to God. It can sometimes feel like we can’t please anyone in our life. Work and home life can suddenly get really stressful; we might handle important situations poorly, or make a rash decision we wish we could take back. We don’t need to be so hard on ourselves, though. God has forgiven us through the sacrifice of Jesus Christ, and we can be at peace with our lives, our actions, and our selves because of this. No matter what goes down in life, we are pleasing to God and have been forgiven. 2. We are unconditionally accepted by God. We are all imperfect. But with a relationship with Christ, we are free from blemish in the eyes of the Lord. Not only have our sins been reconciled, but we are also loved unconditionally through every step of life. Unconditional love is a beautiful and rare thing. It is the purest, most selfless type of love. We seek to give this love to our family members, our spouses, and our closest friends. And we can only hope to receive this kind of love in return. We’re human, however, and it can be difficult. People can say things behind your back, you may do something to upset your family or make your spouse resentful. In these moments, it may seem like unconditional love becomes vulnerable. Not with God! We can only strive to show this pure love to others, as God shows it to us. When he says unconditionally, He means under no condition will his love for you fade. Loving those who love us, our brothers and sisters, is easy. Everybody does that. But God “makes his sun rise on the evil and on the good, and sends rain on the righteous and on the unrighteous… Be perfect, therefore, as your heavenly Father is perfect” (Matthew 5:45-48). Learn How to Honor Christ with Your Actions. 3. We no longer stand condemned before God, and we are deeply loved by God. Jesus, although he is the Son of God, is also himself fully God. Thus, He was able to provide the sacrifice necessary to wash away the sins in our lives. Because of this great sacrifice, we no longer stand condemned in the eyes of the Lord, and more than that, we are DEEPLY loved. Not just unconditionally, but also deeply. We can wake up every morning knowing that even if we wake up on the “wrong side of the bed” (cranky, feeling inadequate), we never wake up on the wrong side with God. Not when we choose a relationship with Him and stand before Him, purified and deeply loved. Through a relationship with Jesus, we become “new creations in Christ.” We have already been created by God, but were given free choice. Through this freedom, we are prompted to choose a God-fearing, Christ-loving existence. With this choice, come the truths I have mentioned above—acceptance, unconditional love, and forgiveness—as well as eternal life. If this has blessed you, if this truth about your relationship with Jesus has blessed you, please share this with someone who also needs to hear some words of encouragement and love. And remember, your sins are forgiven and you are loved. Especially during the holidays, emotions can rise, thinking about loved ones and perhaps painful experiences from the past. We can allow that guilt to overwhelm us, or we can turn to our Savior, and remember that He loves us unconditionally and deeply, we are accepted, and we are offered a righteous existence with the hope of eternal life. A relationship with Jesus Christ is powerful, and I hope this message brings comfort to you this holiday season. 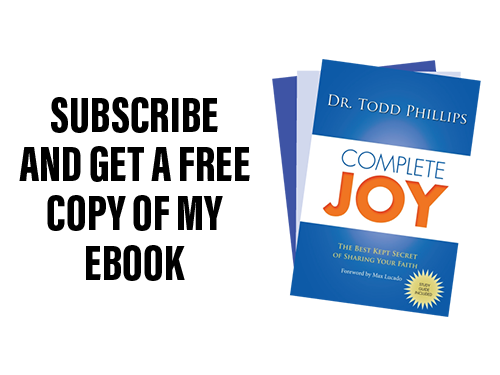 Hey this is Todd Philips, your online pastor and personal life coach. Here today to talk to you about some very exciting truths that comes straight out of the Bible for all of us who are followers of Jesus. Now, I know based on responses on my Facebook page and toddphilips.com, that I have a lot of people that watch these videos, some of you just don’t have a relationship with God. In fact, you question whether God exists or not and that’s A-Okay! I’m glad that you’re here, and I’m praying that the time that we spend together will allow you to learn more about this God that I speak about all the time and His Son Jesus, who came to this Earth in the form of a man to die on a cross eventually to take care of all the things in our life that go against God’s plan. And now I have talked about that a bit more extensively in a couple of the other videos, the links to which will be below this video today. So if you’re not a follower of Jesus, or if you’re just questioning the claims of Christ, or want to know what the Bible is all about, please take the time to go to those links because some of the things I’m going to be sharing today are promises that God makes to those people who follow him, who decide to become followers of Jesus. So I hope you’ll consider that. For those of you that are followers of Christ, this holiday season, I just wanted to remind you of a couple things. I’ve been writing these down and just reminding myself of exactly what it means to be a follower of Christ and what that means in relationship to us and God, and there’s a couple things I want you to hear. Because of Jesus and because of what he did on the cross to die for our sins—past, present, and future—because we’ve been forgiven, through our faith in Him. Number one: We’re completely forgiven. We’re completely forgiven and we’re fully pleasing to God. I want you to hear that. We’re completely forgiven and fully pleasing to God. In fact, Hebrews 8:12 says this, “For I will forgive their wickedness and remember their sins no more.” There’s even a passage that talks about the fact that God takes our sins and casts them as far as the East is from the West. Now, I want you think about this for a minute. If you go north on the globe, on the Earth, if you go north on the globe long enough, eventually you go what, South right? So, if you go north long enough, eventually you start going south. If you go east long enough, eventually you start going east. You just keep going east, right? As far as the east is from the west, He’s saying He will remember your sins no more. He used that phrase for a reason to help us understand we are completely forgiven, so as Christ-followers we can stand on that truth. The second thing is this: We are unconditionally accepted by God. Now, a lot of people ask me what tools that I use online. The one I’m using right now actually is called Bible Gateway. Now, a lot of you already use this probably, but if you don’t I would really encourage you to go to Bible Gateway. You can get to these different passages very quickly and understand better exactly how to read the Word in reference to some of the topics that you’re looking through. See, that’s another promise from God, as followers of Jesus we are unconditionally accepted. There’s nothing we can ever do or say to cause God to love us any less. I hope that’s really seeping into your heart; again this holiday season as we celebrate the birth of Christ, our Savior, what does it really mean to have this relationship? Well we’re completely forgiven; we’re fully pleasing by God; we’re unconditionally accepted by God. Number 3: We no longer stand condemned before God, and we are deeply loved by God. Here’s an incredible passage that I want to share with you regarding that. It’s out of Colossians Chapter 2: 9-10. It says this, “For in Christ, all the fullness of the deity lives in bodily form.” It speaks to Jesus being fully God and fully man. And it says this in Verse 10: “And in Christ you have been brought to fullness. He is the head over every power and authority.” We’re deeply loved. We no longer stand condemned because He, being fully God, was able to provide the sacrifice needed for the sins in our lives, and because of that we no longer stand condemned. What an incredible thing to know — that we can wake up every morning no longer condemned before God; we’re in a right relationship with us, and he loves us unconditionally. And finally, and this is amazing: We’re made brand-new. The Bible says we’re “new creations in Christ.” I’ll take you here to Titus, the New Testament, Titus 3: 3-7: “At one time we too were foolish and disobedient and deceived and enslaved by all kinds of passions and pleasures. We lived in malice and envy being hated and hating one another,” but Verse 4, “but when the kindness and love of God our Savior appeared, He saved us not because of righteous things that we did, (not because of what we did on our own), but because of His mercy. He saved us through the washing of rebirth and renewal by the Holy Spirit, whom he poured our on us generously through Jesus Christ our Savior. So that having been justified by His grace, we might become heirs, having the hope of eternal life.” We are brand new creations and we are made complete in Christ. You know, this word justified is confusing to some people, but I really tell people this: when you’re justified by your relationship with Christ, it means it’s just as if I’d never sinned. If you can remember that, you can remember the power behind a relationship with Jesus. So this holiday season and again all these passages and some others that support these things, these truths, will be down below the video, and I want you to take some time to read those. Now, one of the things that I want to ask — here’s my challenge today: If this has blessed you; if this truth about your relationship with Jesus has blessed you — maybe you have a friend or a family member who is also a Christ-follower who for whatever reason is going through real challenges right now — maybe there’s an illness, loss of a job, a bad relationship; I don’t know what that may be, but you know who that is, if you’ve got someone in your life that’s going through a challenge and they need to hear these truths, that they are completely forgiven, unconditionally accepted, that they no longer stand condemned, and they are a new creation in Christ. Would you share this video with them? Send this link to someone who desperately needs to be reminded of exactly what it means to be in a relationship with God through Jesus Christ. I hope this is a blessing to you this holiday season. This entry was posted in Blog, Spiritual Development, Videos and tagged Bible, Bible study, Christianity, Christmas, God, holidays, Jesus, Life Coach, Love, pastor. Bookmark the permalink.